Maintaining an arena is not always easy. Depending on how much traffic you get a day on your riding ring, you could potentially be grooming it every few days. I want to take a look at the cost of maintaining a sand arena. For this price breakdown, we are going to assume the following scenario: you have an average 66 x 130 indoor arena with 5 horses a day on the footing. With 5 horses a day, you will have to drag every other day from the ruts and holes that appear. You own a newer compact diesel tractor that has 40hp and a 5ft arena groomer. It takes you 45 minutes to groom your arena from start to finish. You ride year round in your indoor arena. If you groom your arena for 45 minutes every other day, it equals out to spending 8,213 minutes or 137 hours a year grooming your arena. If you are paying a farm hand to do the work, say minimum wage, (here in New York, minimum wage is $9) you would spend $1,232 paying your farm hand to groom the arena. On top of the time and wages to groom the arena, you also have to pay for gas for the tractor to groom the arena. For your newer (5 year old) compact diesel tractor to work this arena all year with diesel fuel at $2.40/gallon; you would spend $493 per year. Total grooming maintenance per year for your sand arena: $1,725. Now that number is just looking at grooming the footing. The other issue you deal with in any sand arena is dust. We can take a look at both watering your arena and using Magnesium Chloride Flakes, which seem to be the other popular options. You could get a sprinkler system installed, which is thousands of dollars up front, but then you are still using hundreds of gallons every time you water your footing. Another option is to hand water your arena with just a long hose. Again you are using hundreds of gallons of water to accomplish this, but then you are spending roughly an hour watering the arena. You would have to hand water it every four days, and if you pay a farm hand to do that it would be $821 in wages a year. If you have a well you have to be conscious about how much water you use so that your well doesn’t go dry, and if you have city water, you have to pay per 1000 gallons you use; which can add up pretty fast if you’re constantly watering an arena. Many people use Magnesium chloride flakes to fight dust in their arenas. Magnesium chloride flakes are roughly $20/bag. For your 66×130 arena, you would need two pallets, or 96 bags; totaling in $1,920 for your arena. These would have to spread and then mixed into your footing. Magnesium Chloride has to be continually added to your arena, therefore forcing you to spend more money all the time to fight the dust. Instead of worrying about the cost of maintaining a sand arena, switch to an arena footing that will never have to be watered and will remain dust-free! You not only save lots of time and money not worrying about your footing being watered, but you also save on maintenance. We have many customers say that they only have to drag once a month! 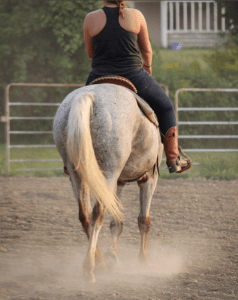 The sand, fibers and wax create a stable surface that supports your horse in every stride it takes, while not moving too much to the point where holes and ruts are created. Although synthetic footings are pricier up front, but you will save both time and money over time as our footing continues to out perform traditional sand footing. We had a great show at the New York State Farm Show this past week. Shows really give me an opportunity to educate many barn owners, trainers, and riders about our footing. They get the chance to stick their hands in it and get a feel for the different properties of each footing. When I go to shows I always pay close attention to the different questions that I’m asked. The most popular question at this show was “how long does your dust-free arena footing last?” Footing longevity is our most popular questions! The longevity of footing really comes down to the components of it. Let’s take a look at the sand this week. You have no idea how different sand particles can be until you start comparing them. We have looked at sand from all over the world! The size, shape, and mineral composition are the most important properties when it comes to sand for horse arenas. Mineral composition is going to be the most important. Basically, this is how hard or soft your sand is. For a horse arena you need something that is very hard and can take the pounding of hooves on it. If you choose too soft of a material, it will break down into very fine particles and create dust in your arena. 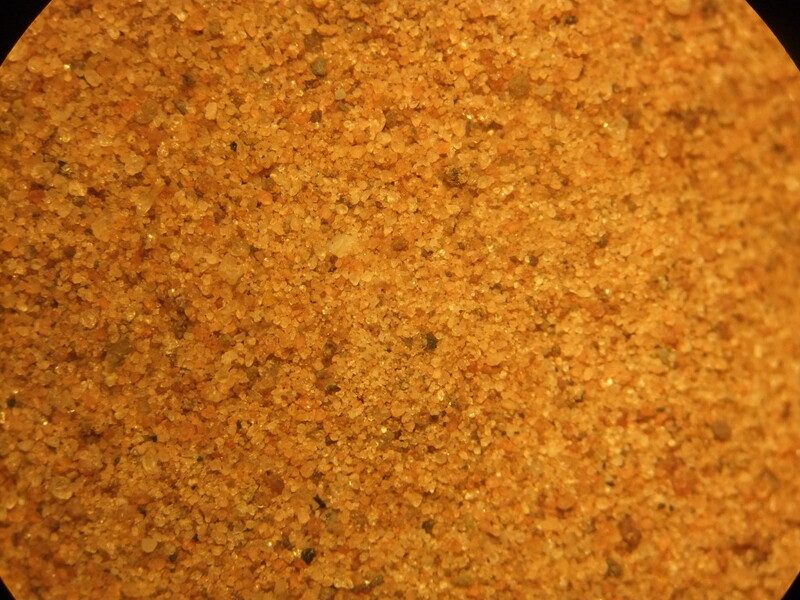 Choosing a hard sand particle is the first and most important thing when it comes to the longevity of the footing. The particle shape is the next most important. The shape of the sand plays an important part in the way the arena footing will perform. If you choose a rounded particle, it will create an unstable surface because these particles tend to roll. But if you choose an angular or subangular sand, it will lock together creating a more stable surface. You want your sand to lock together to create the stable surface but you don’t want them to lock too tightly together; this could potentially create a very hard, concrete like surface. Lastly, you can take a look at choosing between clean/washed sand or unwashed sand. If you just get sand from a pit, it could contain a lot of silt, clay or organic material. All of these materials are the components that make up dust in your arena. Some barn owners decide not to clean their sand because they believe that the sand will move more if it doesn’t have all of the impurities holding it down. You will have to decide if you’d rather use clean sand or uncleaned sand. Sand is a huge factor in how long your arena footing will last. We specifically looked for years for the perfect sand that we wanted to use in our footing. We found one that is very hard, has the right shape to it, and has no organic material in it. By using this specific sand we have created the perfect formula for our dust-free footing. Next week we can take a look at the specific additives in our footing and how that truly affects the breakdown of the arena over time! How did you decide on what sand to use in your arena? Have ever tried to run on the beach? Not on the wet sand near the water, but in the dry, deeper sand? You have to struggle just to walk through it; running is even harder! Horses struggle just as much through deep sand. Having deep sand in your horse arena can be potentially dangerous for your horse. Over a year ago, I wrote my first post introducing myself as part owner of IGK Equestrian. I created this blog so I could address some of the main challenges associated with arena footing and stall bedding and share success stories from people who have used the products. I’ve covered topics ranging from dust control in arenas to tips on how to “go green” in a horse stall. 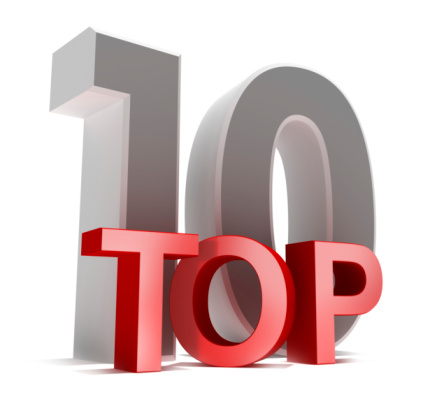 Here, in reverse order, are the 10 most popular posts to date on Carolyn’s Footing and Bedding Blog. #10: Is Your Horse Eating in Bed? This post revealed horses on restricted calorie diets were ingesting wood shavings in their stalls. Typically, wood shavings aren’t a horse’s “go-to” snack, but when on a diet, bedding can look pretty tasty! #9: Fuming Over Stall Odor. When drainage is poor, or stalls aren’t mucked out regularly ammonia fumes and bacteria can build up. This can be irritating and harmful for both horses and humans. #8: The Link Between Sand Footing and Lameness. A study by the University of Glasgow showed the type of arena footing, specifically sand, can be a risk factor for lameness in dressage horses. #7: Cutting Back on Bedding. Replenishing materials and mucking out stalls can be a hassle. This post suggests using a mat system with a waterproof top cover because it helps reduce the amount of bedding and disposal costs. #6: Is it Time to Change my Stall Mats? If you are using a lighter- weight mat, you may have to remove it once a month to re-level the stall; however, with heavier mats, this may only be a semi-annual event. #5: Horse Stalls can “Go Green” Too! At a young age we learned the 3 R’s: Reduce, Recycle and Reuse. This popular post proposes ways to make environmentally-friendly choices when it comes to your horse’s bedding! #4: My Names Carolyn “I’m an Arena Footing Freak!” This was my first post introducing myself as an arena footing freak! From this point on I aimed to educate my readers about both arena footing and stall bedding. 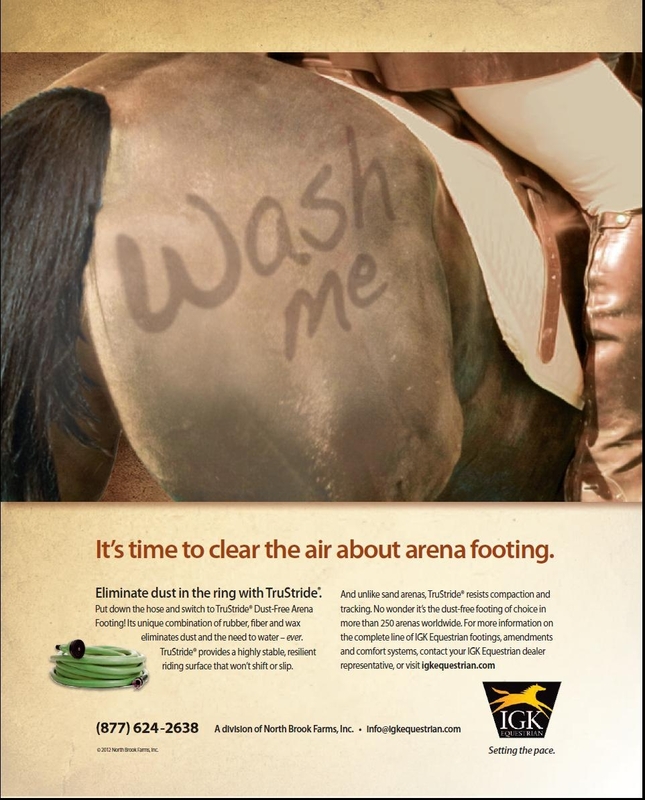 #3: Dust Control in your Arena. Dust in the arena is common, and suggestions on how to control dust is a topic we’ve returned to time and again on this blog. #2: How to Create a Safe Foaling Stall. A lot of people are searching the Internet for ways to create a safe foaling stall. Needless to say, quite a few of them are landing on this post. #1: Solid Rubber Mat vs. Foam Mattress…Which is Ideal for Your Stalls? This informational post compared two popular types of stall mats. If it helped you make a decision, I’d love to hear from you! Meet TruStride customer Nancy Rosen! 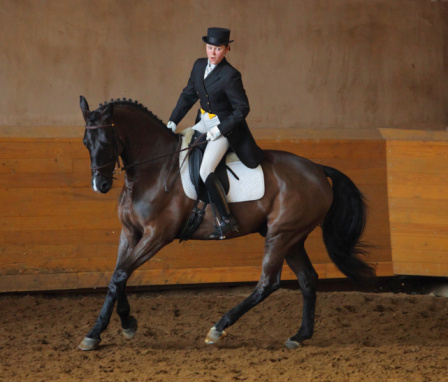 Nancy Rosen is the owner of Frog Hollow Farm, a dressage training facility in Esopus, NY. Nancy installed TruStride arena footing at Frog Hollow two years ago, and is happy to answer questions about her experience. How did you hear about TruStride? At the time I was doing a lot of reading about various arena footings out there, searching for an alternative to sand. What made you choose TruStride? I wanted a surface that would absorb the shock of hitting the hard ground but at the same time wouldn’t absorb the bounce that dressage needed. Ultimately, I didn’t want a footing that was dead. I needed a more lively surface. These factors lead me to TruStride and I’ve been extremely happy ever since. What were you using before installing TruStride? My former outdoor arena was made up of a combination of stone dust and sand. I’ve tried many materials over the years but I couldn’t find a footing that gave me everything I wanted. The indoor facility was initially made up of composted manure but it created a lot of dust. So I tried switching to sand, which was also dusty and it didn’t have enough bounce—it just absorbed all the energy. That is why I’m so glad I came across TruStride. I ended up building it on top of the dormer outdoor arena and it is now the footing in the indoor facility. Have you noticed a difference? TruStride has made a huge difference in the arena. The horses really move well on it and the riders love it, too! TruStride absorbs harshness in the stride which makes the horse’s movements feel so much softer. The people at IGK Equestrian are wonderful to deal with. They are very responsive and easy to get a hold of. Every now and then I will call to ask if they can tweak the footing a little bit and they always do it. I have been extremely pleased with my experience. In fact, I just recommended them to someone else! 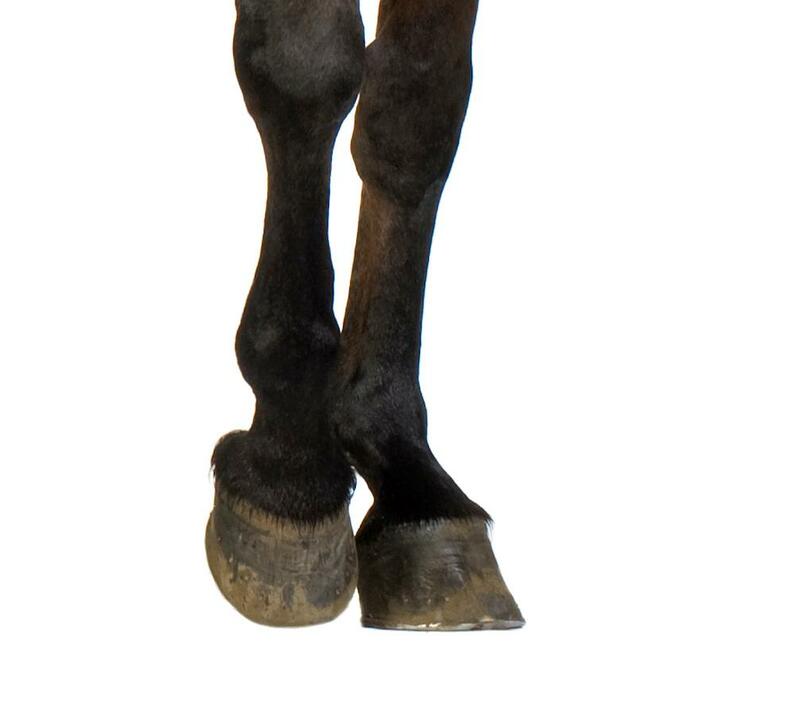 For more information on TruStride®, Dust-Free Arena Footing, visit IGK Equestrian. IGK Arena Footing Ads Win Big! I am thrilled to announce two of IGK Equestrian advertisements, created by LP&M Advertising, were among the winning entries in the regional “Best of NAMA” competition for the National Agri-Marketing Association! For those who don’t know, this specific award show honors excellence in marketing communications for the agriculture and animal health industries. Our ads were placed in the regional competition which featured entries from agri-marketing agencies throughout the northeast United States and mid-Atlantic. Both ads displayed horses resorting to extremes to avoid dust caused by sand arenas. Wish us luck as the entries will now advance to the national Best of NAMA competition in April! Arenas Can “Go Green” Too! My last post, Horse Stalls Can “Go Green” Too was such a hit, I decided to write another on how environmentally-friendly choices can be implemented in your arena! Another option to consider is installing footing made of recycled materials. Look for dust-free footing comprised of ground up rubber shoe soles, tire buffings or other recycled rubber/fiber materials. TruStride, a Dust-Free Arena Footing by IGK Equestrian not only eliminates the need for watering—ever—but it greatly reduces maintenance. Its environmentally-friendly combination of recycled rubber, silica sand and synthetic fibers provides a flexible and resilient riding surface making it a popular choice among arena owners worldwide. How do you practice “going green” in your arena? Need another reason to avoid sand arena footing? How about lameness? 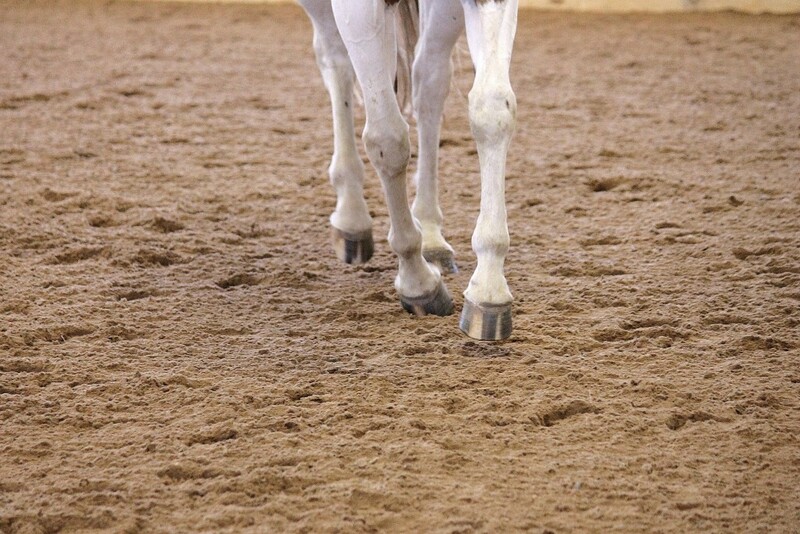 A recent study by the University of Glasgow showed the type of arena footing can be a risk factor for lameness in dressage horses. Researchers surveyed registered members of British Dressage to investigate relationships between surface footing characteristics and the likelihood of lameness. They found that woodchips were strongly associated with slipping and sand with tripping. The least problematic surfaces were those that were wax coated and those that were a combination of sand and rubber. In a recent article on this study, The Horse suggested one explanation for the results is the unevenness of sand and woodchip surfaces, in both wet and dry conditions. Horses are more likely to trip on coarse sand because it is easier to lose balance and they are nearly 13 times more likely to slip on woodchips than any other surface, according to the article. To minimize slipping, tripping and lameness, be sure to train on a wax-coated footing surface like TruStride® or LiteStride® by IGK Equestrian. In addition to providing a stable, flexible and resilient riding surface, both footings eliminate dust and the need to water—yet another advantage over sand arenas. How do you reduce trips and slips in ­your arena? Have you noticed your arena is dustier than usual? You’re not alone. Arena dust is more apparent in the summertime, especially with the hot, dry weather we’ve been experiencing lately. Riding just exacerbates the problem because the more you ride, the more your footing breaks down, eventually becoming airborne and creating dust. Constant inhalation of dust can cause serious respiratory problems for horses and riders. Here are some ways to reduce and sensibly manage dust in your arena for everyone’s safety. 1. 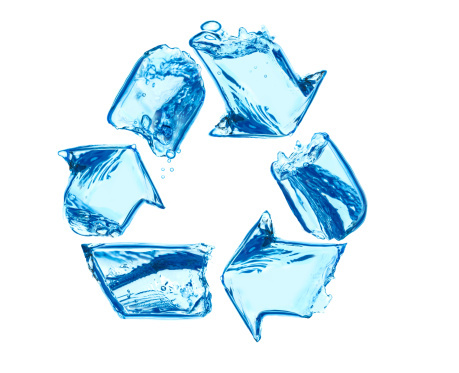 Water: The most common method of controlling dust is through watering. The key is to water heavy and seldom, rather than frequent and light for the best results. Watering is cost-effective, readily available and highly effective if done properly. However, in large arenas you could be using up to 3,500 gallons of water a day just to keep dust under control. 2. Salt: Another common dust suppressant is the addition of salts to your footing. Salt additives work best in high humidity because they draw moisture from the surrounding area, which helps to effectively suppress excess dust. The downside of this tactic is that eventually the salt will wash away making reapplication a constant nuisance. 3. Wood: An additional buffer that helps to control dust in the arena is wood shavings or pieces. Wood helps to slow the breakdown of sand while also helping your arena retain moisture. After some time, just like salt, the wood pieces will break down, but with regular watering you should be able to minimize dust for an extended period of time. 4. 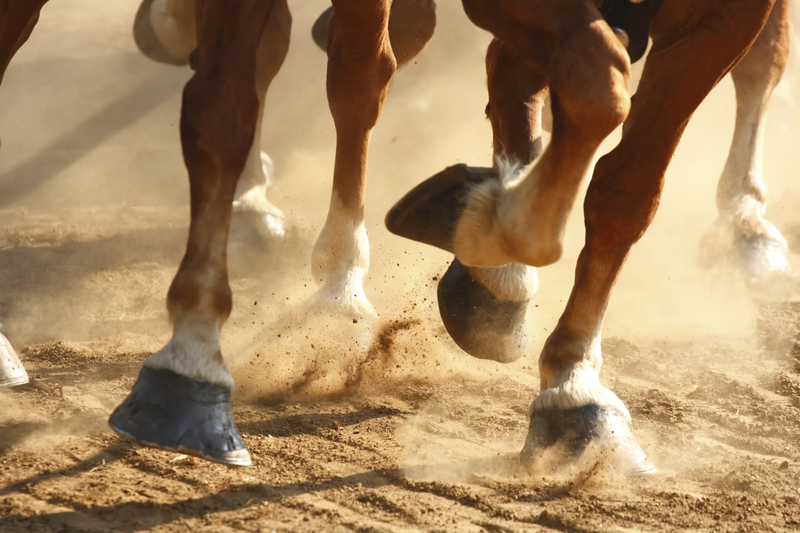 Footing: The best way to combat dust in your arena is to eliminate it altogether. This can be easily achieved by using a dust-free footing, such as TruStride® or LiteStride®, manufactured by IGK Equestrian. These arena footings eliminate the need for watering, reduce maintenance requirements and provide adequate support for both horse and rider. Did I mention both TruStride® and LiteStride® are dust-free and reasonably priced? Now that’s a long-term investment sure to minimize dust and maximize riding potential in your arena. How do you effectively manage dust in your arena?